Rosh Hashanah greetings in Hebrew: How to celebrate Jewish New Year in Hebrew. Rosh Hashanah celebrations- Best greetings for Jewish holiday (Image: GETTY). JEWISH holiday Rosh Hashanah hails the beginning of a New Year when people of the Jewish faith will partake in introspection and spiritual renewal. How do you celebrate the Jewish New Year? By LIAM DOYLE. 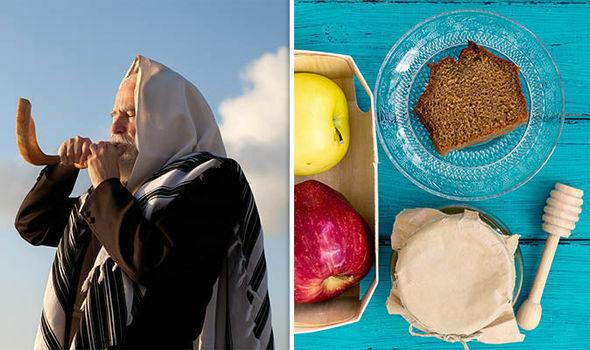 Rosh Hashanah literally translates to ‘the head of the year’ and is a time of renewal for many observers, with celebrations taking place across the planet. The period precedes the Ten Days of Repentance, which carry through until the holiday of Yom Kippur, the Day of Atonement. Rosh Hashanah falls during Tishri, the seventh month on the Jewish calendar, and likely originates from a biblical enthronement ritual. Rabbinic tradition (mainstream Judaism) dictates that the beginning of the year will always fall in the seventh month despite the calendar having 12. How do you celebrate Rosh Hashanah? This year, the holiday of Rosh Hashanah falls on September 9, running until September 11. Rosh Hashanah is traditionally celebrated the same way that most religious holidays are, with copious eating. Feasts are common on both nights while Rosh Hashanah is ongoing and many choose to eat sweet food such as apples and honey at this time in hope of a sweet year ahead. Traditional Jewish dishes enshrine the celebration, such as Brisket (a cut of beef) and tzimmes (a sweet stew). Aside from eating however, there are religious rituals commonly invoked during Rosh Hashanah. Many of these rituals take place in the month preceding, as a sort of preparation for the celebrations. During Rosh Hashanah itself however, people will hear the sound of the ram’s horn (known as the Shofar) each morning, and light candles each evening. The Malkhuyot presents God’s sovereignty, the Zikhronot God’s memory of past deeds, and Shofarot represents the anticipation for the future. What are the best Hebrew sayings for Rosh Hashanah? Rosh Hashanah greetings are generally in the same vein as what we normally say when the Gregorian New Year rolls around. For the September 9 to 11 period, the main greeting used will be “Shanah tovah” which literally translates to “Good Year”. People will also sometimes add the word “u’metuka” which in full will mean “a happy and sweet New Year”. On the return from synagogue service on the eve of Rosh Hashanah, the traditional greeting is “Leshana tovah tikatev v’tichatem”. Noon of Rosh Hashanah marks when people’s fates are already written, and the end is marked by Yom Kippur, when fates for the year coming are set in stone.